I had the good fortune to attend the beatification ceremony for martyred archbishop Oscar Romero celebrated by the Roman Catholic church in San Salvador on May 23. 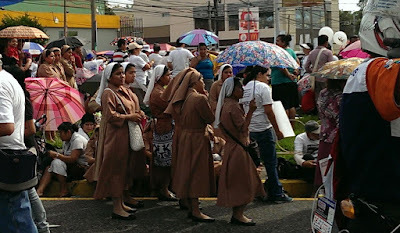 Three of us stood with hundreds of thousands of Salvadorans in the streets surrounding Plaza Salvador del Mundo as the church held up the life and example of the bishop who was the Voice for the Voiceless. The recent surge of deadly violence in El Salvador has caught the attention of the world's press. More than 110 murders happened in the country between Saturday, May 15 and Tuesday, May 19. The average during May exceeds 20 murders a day. The greatest amount of bloodshed is occurring in the eastern part of the country in the departments of Usulután and San Miguel. El Salvador is on pace to become the hemisphere’s most deadly nation -- Washington Post. Photo gallery which accompanied Washington Post story. Ten days are left before the beatification of slain archbishop Oscar Romero in San Salvador on May 23. The beatification solemnities will occur at Plaza Salvador del Mundo in an event to be attended by Roman Catholic cardinals, bishops from 15 countries, as many as nine presidents and heads of state, thousands of Catholic priests and hundreds of thousands of the faithful. The beatification events have their own website here with versions in both English and Spanish with the public, and some might say watered down, presentation of what Romero's beatification is all about. To get a feel for it, you can watch this video spot or listen to the beatification jingle. El Salvador's 2015 national elections have finally concluded. The recount of votes for National Assembly in San Salvador that had been ordered by the Constitutional Chamber finished at last and the court lifted its ban preventing deputies from San Salvador taking their seats. Although the recount produced an increased vote count, the results did not change any of the seats awarded in the original tallies. The weekend of May 2-3 saw tall and fast waves crashing into the Salvadoran coast. The waves caused considerable damage to the pier at the city of La Libertad, and to many of the small cafes and other establishments along the country's Pacific beaches. Similar conditions are now expected to return on Wednesday, May 13. Well known businesses in electric power, banks, telephone companies, insurance companies, drug stores, department stores, and airlines among others are among those who owe taxes to the government according to the list published by the Ministry of the Treasury. On the list you can find big businesses like CAESS [power utility], Citi Bank, Azteca bank, Santa Lucia drug stores, Telemovil, Digicel, TACA [airline], Siman [department stores], Channel 2, and other companies and individuals totaling 12,519 taxpayers who owe the state more than $372.6 million. More than a dozen families have abandoned their homes in two rural communities following threats from gang members, police in El Salvador said Wednesday.... Residents loading their few possessions into trucks on Tuesday declined to give their names out of fear. They said gang members had gone house to house threatening families. The move comes after four members of one family were killed on April 27 in a turf battle. Some families said that even with police present they no longer felt safe. The story is tragic, but it is incredibly common now in El Salvador. A week ago I was in El Salvador when members of a family I know well called on the phone to say that gang members had burst into their house in the middle of the night, beat up women in the house and threatened the family. Now that family has fled to spend their nights in another community. Former mayor of New York turned public security consultant Rudy Guiliani came to El Salvador today to describe his consulting firm's analysis of El Salvador's violent crime problems and proposed solutions. His remarks were made at a gathering of the National Association of Private Enterprise which has sponsored his consulting work in conjunction with President Sanchez Ceren's Citizen Security Council. Guiliani spent a lot of time talking about how crime was reduced in New York City and Colombia, and asserting El Salvador could do the same. Guiliani remarked that El Salvador needed a single-minded focus on disrupting the control of neighborhoods by gangs through vigorous law enforcement, long prison sentences, and prisons which actually prevent gangsters from continuing to commit crimes from within. 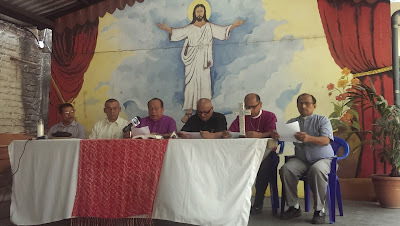 Salvadoran church leaders who are part of the Pastoral Initiative for Life and for Peace (IPAZ) held a press conference, on Wednesday, April 29, to advocate for dialogue in the face of growing violence in the country. IPAZ called for a process of national dialogue, including dialogue with the country’s gangs, as the only path forward to achieve peace in the country afflicted with so much violence. Text of IPAZ press release. The IPAZ press conference followed a week after a joint communique purporting to come from the imprisoned leaders of the country’s largest gangs was released to the public. The statement indicated agreement to a 26 point “peace process” proposed by Raul Mijango, one of the mediators of the original truce, including the gangs’ agreement to unilaterally reduce the level of violent acts being committed against the population, including attacks on the police and military.